Here’s a present for all the mothers! Spiegel® Super Sale results in tremendous buys. An automatic 80% is taken off already drastically reduced items. 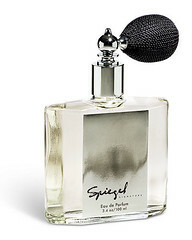 For instance, Spiegel Signature brand of eau de toilette, 3.4 oz., reg. $49 is markdown to $10, and when added to your cart is furthered reduced by an additional 80%, final cost is only $2+sh. Shipping can be pricey, but the extra savings makes it negligible. Most fashion offers are misses sizes, but there are also cosmetic, shoe and accessories deals well worth investigating. Deal Online & Steal These Bargains! 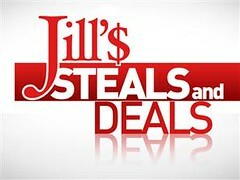 On The Today Show this morning, Jill Martin, contributing host, showed 5 Terrific MarkdownDeals offered with savings of at least 75% off. The catch, if you can call it one, is that these deals are only good for 24 hours and you may face an overloaded server. But even given that these are worth the effort. Hurry Quantities & Selections Are Limited & Only Good For Today!!! Need More Bargains? Check The Today Show’s Deal of the Day! MarkdownMom walked into JCPenney®’s yesterday right into a double dip sale! All through the store, summer merchandise that can easily transition into Fall was marked down 40%-80% off, and at the register another price reduction, certificate incentive of $10, off the markdown price! These reductions amounted to MarkdownMom paying about 20% of retail! Just in time for Back-To-School! Be sure to print the coupon and keep it in hand when you go to the Mall! Overstock’s at Lands’ End are 50% or more off and now with free shipping, this is a great bargain. 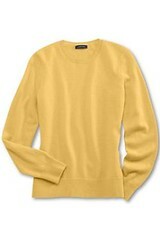 MarkdownMom has always loved their apparel many made from 100% cotton interlock knit, and their cashmere deals. Now find some terrific deals and save a bundle on free shipping. Items include girls, boys, men’s, women’s (reg., petite & plus), home and travel. Check their On The Counter items, that will be marked down again until all are sold like this cashmere classic sweater (shown) in petites and plus sizes, in jonquil, vivid plum, loden green, light seagrass, and hot for this season, french pink, reg. $129.00-$139.50 now $40 ! Repurposing can be more than taking something you own and reusing it for something other than its’ original purpose. Now this can also mean taking something you can buy at a bargain basement price and rethinking its’s application. For instance, Potterybarn’s Sale items although having a great clearance price, may not include the entire set. For instance,oftentimes you can great buys on king size pillowcases, but can’t buy the matching sheets. However, with our electic styling of mixing and matching, you can buy these at a tremendous savings and match them to something you already own. Have a queen size bed, and not a king? Buy the king anyway, because king will fit your queen size pillows, and king size pillows will fit your queen size bed. MarkdownMom found this bench and it was advertised by Potterybarn for $4.99. 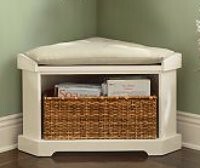 Caught your eye with that price; however,if you are a frequent shopper of Potterybarn sale items you know that it doesn’t apply to the bench. Instead it is the cushion of the bench that was originally $49.00, on sale for $4.99 in cardinal, raffia,and sage. Now this cushion will work if you have a bay window or any bench. MarkdownMom bought it for both in raffia and sage. Plus you can pair them together to make a rectangle cushion and mix and match two colors! Repurposing what you buy. Neat, huh? Another example of thinking out of the box,or in this case, bench!